We here at FHM aren’t really big on recipe books, but Annie Guerrero’s A Pinch of Love, A Cupful of Passion gives an entirely new perspective to the promises given by a cookbook. First among many significant differences is dedicating chapters to the main Man above. Chapter 4 does exactly that. Chapter 3, on the other hand, pays homage to stories associated with a certain dish, with the likes of Tintin Bersola-Babao and Viking Logarta giving their own cravings and the story that go behind it. Chapter 1 introduces the reader to the most significant recipes made by the kitchen’s finest cooks from all over the world, with excerpts coming from the likes of Shakespeare and Julia Child. Chapter 2 is, appropriately, dedicated to the best work coming from CCA alumni and students alike – Chef Paulo Sia, Chef Cristine Nicolas, and Chef Menoy Jimenez. From something as perky as a Cherry Double-Chocolate Chip Cookie to something as sophisticated as a Tagliarini, the recipes are most often laid out in 3 to 4 easy steps, perfect for every man’s kitchen attention span. This cookbook is a nice compilation of not only of the world’s friendliest dishes, but also a mixed venture of stories, experiences, versions, and touch coming from different people, both relevant and anonymous ones. 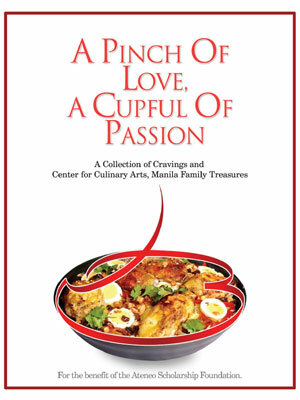 Indeed, A Pinch of Love, A Cupful of Passion is a marvelous collection from Cravings and Center for Culinary Arts, Manila, along with their precious family treasures.